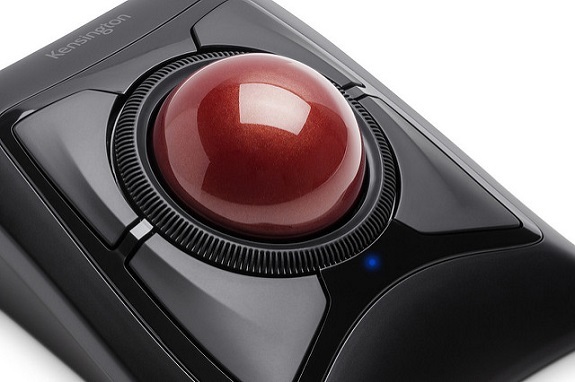 Kensington®, a worldwide leader of desktop computing and mobility solutions for IT, business and home office professionals, announced today that its new Expert Mouse Wireless Trackball has received high marks from users across industries including music, graphic design and computer software. Designed to give users more flexibility, the new trackball delivers exceptional comfort and ease-of-use, while reducing clutter from the desktop with the absence of a USB cable for connectivity. The Expert Mouse Wireless Trackball gives users more freedom of placement while working because they aren’t limited by wires. The trackball can be connected either through Bluetooth®4.0 LE or through a widely compatible USB receiver. With Kensington’s free TrackballWorks™software, users can customize the trackball to suit their personal needs for greater productivity. DiamondEye™ Optical tracking offers smooth, precise cursor control while the award-winning Scroll Ring allows for quick scanning up and down documents or web pages. The use of trackballs in both home and office-based computing environments is growing in popularity. Many users find the repetitive clicking and dragging motions required to use a traditional mouse to be ergonomically problematic. A 2015 Kensington survey revealed that users switch from a traditional mouse to a trackball primarily because trackballs deliver greater speed and accuracy, offer better ergonomics, and are more efficient in small or tight workspaces. The survey also revealed that wireless connectivity was the most requested feature users would like to have in Kensington trackballs. The new Expert Mouse Wireless Trackball joins the company’s family of trackballs that deliver exceptional comfort and ease-of-use, setting the industry standard for more than 20 years. A giant-size Kensington trackball was featured in a “Walk Through Computer” exhibit held in Boston, 1990-1999. The giant exhibit featured an authentic-looking, two-story working model of a desktop computer enlarged to 50 times its normal size. The purpose of the exhibit was to show the anatomy of a computer and to explain how the various parts worked and communicated with each other.